Next Article« Headless “Fat People Pictures” are worth their weight in gold. Today I read a story that I had to share so I asked Mark Dean if I could feature him as a guest blogger and he agreed. A few months ago a Facebook friend posted a link. It was about an obese man and an incident she had with him. It is insightful reading at Bariatric Girl.com found here. I was reminded of a similar experience that occurred with me several months earlier. In my twenty-four years as a funeral director, I have seen drastic changes in the weight and size of the individuals that my wife and I care for at our family-owned funeral home. The interior width of an average casket is twenty-seven inches. In 1987, we may have used an over-sized casket once or twice a year but now casket manufacturers are creating entire lines specifically for the morbidly obese. Earlier in the year we were honored to care for a family in their time of loss. One young man in his early 30’s asked if his mother could come to the funeral home before normal visitation hours to pay respect. He stated that his mother had a medical condition and that she became very anxious when she was around large groups. He further explained that she was obese and self-conscious about her appearance. Dressing and transportation would be difficult for her. I quickly agreed hoping to eliminate any further grief for this family. Looking back, I regret that my thoughts of this lady were negative. Without meeting her I expected someone unkempt, unhappy and negative. I had made a note to myself to keep my eyes open for her. Surely she would be expecting some type of special treatment. When I finally met her my initial opinions couldn’t have been more wrong. I heard a pleasant “good morning” coming from a bright smiling face! She was so grateful for getting special considerations. The red gown was clean, her hair neatly styled and her make-up flawless. Matching slippers and purse completed the outfit. After a short time she was ready to go back home but was anxious to talk with me before leaving. I found her entertaining, witty and funny. She was protective and crazy about her family. After she struggled back to her van with the aid of an over-sized walker, I wondered if she had friends or interest outside of her family. She was such a pleasure and joy to be around. Six months later the same son walked back into the funeral home. He asked I if remembered him. After some reflection with the help of my wife, I did. Sadly, his mother had passed away. Could we help him? She had been diagnosed with cancer. Because there were no CAT scan machines large enough for further diagnostics her treatment was limited and death was quick. There are many obstacles that a funeral director deals with when handling the remains of a morbidly obese person. The first is transporting to the funeral home. You are always afraid that your equipment will fail. Most mortuary cots have a 550 pound weight limit. Your embalming table is only twenty-nine inches wide. The physical demand for moving the individual is overwhelming. Thanks to some good friends in the business, we were finally able to begin our process. Next there is the issue of a casket. Over-sized caskets can triple the cost. Then there is the issue of an over-sized vault. Because the vault is over-sized, the family is usually required to purchase two graves instead of one. There are only so many doorways in a building that can accommodate an over-sized casket. 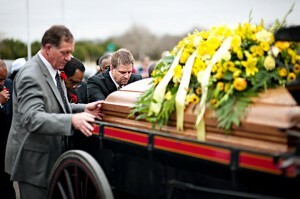 Twelve pallbearers carried her to her final resting place. I found myself both grateful and sad. Grateful, because for twenty minutes, this lady poured sunshine into my world. Sad, because her obesity robbed most others from my same experience. Your blog will be an eye opener for many. When I lost my mom 2 years ago, and the undertaker came to get her body, as if the pain of losing her wasn’t enough, I found it totally unbearable & I cried uncontrollably as I watched them (it took several men) lift her and put her into a body bag and on this VERY narrow transporter with wheels to their van. I remember crying aloud that she’d fall as the table wasn’t wide enough and how horrible I felt for her to be leaving her home this way. My moms 2nd cause of death on her death certificate……yep……OBESITY! Her primary care physician talked her out of weight loss surgery. He is an obese old fashioned doctor and could benefit from WLS himself in numerous ways. I have made it my passion and life long goal, to help educate people including doctors on the positive side of WLS. THANKS Yvonne, you once again have brought tears to my eyes…..tears of joy as I know you are ALWAYS helping people understand the whole picture and get a better understanding of what WLS is all about. A few years ago I took an undergrad course titled “Death & Dying”, in this class we took a field trip to a local funeral parlor that actually offered the choice of cremation… As I do not know anyone personally who has been cremated, I was surprised that if cremation is chosen you still have all the options available to you for a ceremony, memorialization, and final disposition. Numerous unique and special services were offered. Since this particular funeral parlor exclusively uses the Nassau Suffolk Crematory, they can personally attend to all the arrangements for you.During this VERY unique experience as a field trip for me, we were offered the opportunity to actually see the inside of the cremation site, many said, “no thank you” but I went in. As I stood there and watched them open the two sites I asked if their was a maximum weight capacity for cremation at this location….the funeral directors response was “yes, 500 lbs because more than that would clog up my system and possibly ruin our equipment”. I left with an AWEFUL feeling in my stomach of how horrible it would be for a morbidly obese person of 500+ lbs who chooses this option and not to be granted it as their final wish! When all else fails, Google. I found one story that for the people they cannot handle they can contract out the cremation and equipment needed. Here’s the story I found. This must be so difficult for everyone involved. It is truly a sad and rarely mentioned situation. I spent 30 years trying to break free of my obesity. I just wanted the inside to match the outside. Weight loss surgery gave me that. I spend my time supporting others that have had WLS but hope to help others see inside each obese person because they are just as valuable as a thin person. Too bad our society doesn’t think so. Oh! How do i know and I feel for people who are over weight. I use to be over weight and weigh at 410 pounds before I had my WLS. It is very sad at what you have to go thru on this earth while living and them when you pass over you still get bad rap. Congratulations Lisa. I was only 260 at my highest and thought I was huge. WLS has been a life saver for those that were 400, 500 and up. Weight lose surgery certainly saved my life and not only did people treat me differently but I treated myself differently! mydomain.com”. Do you know the way I can change this? I’m sorry I missed your comment. You can contact me at yvonne@bariatricgirl.com and I’ll be happy to help!